MALE, Maldives (AP) — As election officials made final preparations for nationwide elections in the Maldives, the European Union said it is not sending observers because the country has failed to meet the basic conditions for monitoring. In the capital, Male, pink and green campaign banners hung in the streets. Election commission spokesman Ahmed Akram said the country was fully prepared to hold a free and fair election on Sunday. But in neighboring Sri Lanka, exiled former Maldives President Mohamed Nasheed, a leader of the opposition, said Friday that the vote could be rigged. A decade after Maldivians took to the streets to welcome democracy to the series of coral atolls in the Indian Ocean, voters head to the ballot box in what has become a referendum on whether democracy will stay. The Maldives’ third multiparty presidential election is being held five years after incumbent President Yameen Abdul Gayoom began consolidating power, rolling back press and individual freedoms, asserting control over independent governmental institutions and jailing or forcing major political rivals into exile. Beyond the postcard image the Maldives has of luxury resorts and white sand beaches, the 400,000 citizens of the former British protectorate have struggled to maintain the democratic system established in 2008. Yameen has jailed two former presidents including his half-brother, Maumoon Abdul Gayoom, the Maldives’ former strongman, his former vice president, two Supreme Court justices, two former defense ministers and scores of others after trials criticized for a lack of due process. As protests culminating in violent confrontations with police and mass arrests have grown, opposition parties — many of them Yameen’s own former political partners — formed an alliance in exile with the aim of unseating him. Thorsten Bargfrede, head of the political department at the EU mission in Colombo, the capital of neighboring Sri Lanka, said Friday that the group is not sending a monitoring mission because the Maldives has not met the basic conditions. He did not elaborate. Gulbin Sultana, a researcher on the Maldives at the Institute of Defense Studies and Analyses based in New Delhi, described the state of the country as a “democratic dictatorship” in which Yameen has been carrying out his whims by legally amending the constitution. Gross domestic product more than doubled between 1990 and 2015, life expectancy at birth has increased and poverty declined, although high youth unemployment and low participation of women in the workforce persist, according to the World Bank. Part of that growth is due to aid and investment from China, which is challenging India’s long-held position as the dominant outside power throughout South Asia. China considers the Maldives a key cog in its “Belt and Road” project along ancient trade routes through the Indian Ocean and Central Asia. Former President Nasheed said the elections could be the last chance to extricate his country from increasing Chinese influence, which he described as a land grab in the guise of investments in island development. 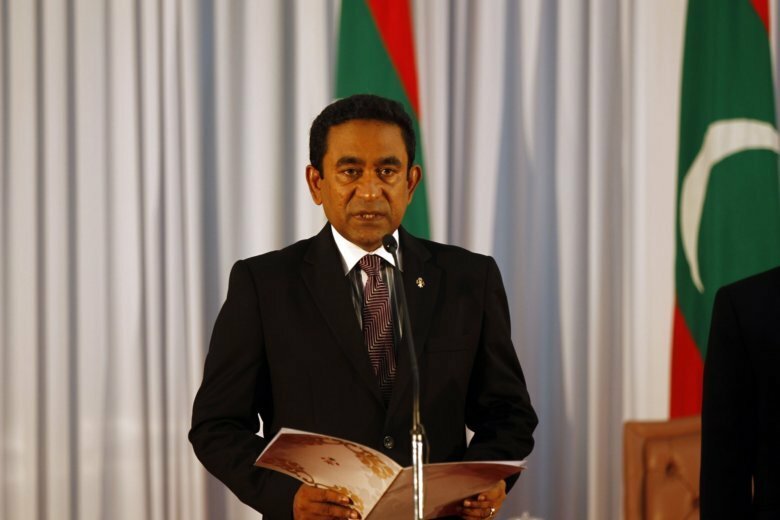 “We believe that the Chinese government has an interest in maintaining the authoritarian rule of President Yameen,” he said Friday at a news conference in Colombo. Political struggle has long beset the string of atolls. The former British protectorate did not inherit a full parliamentary system of government like many other colonies. In 1953, the 812-year-old sultanate was abolished in favor of a republic, then restored again a year later until 1968. Gayoom came to power in 1978 through a public referendum. Calls for the recognition of political parties were violently suppressed and activists jailed during Gayoom’s 30-year authoritarian rule. Gayoom finally introduced democratic reforms in 2008 after a public revolt and the burning down of police stations and government vehicles over the killing of a man in government custody. However, when Gayoom was defeated at the polls by pro-democracy activist Nasheed, it seemed to signal a new chapter in the islands’ turbulent history. Nasheed became famous for drawing global attention to the perils of climate change that saw rising sea levels threaten the Maldives’ coral reefs, which rise less than a meter (3.2 feet) above sea level. “The inundation of the Maldives is just a generation away,” he warned. But at home, Nasheed struggled to get support from officials still loyal to Gayoom, and resigned in 2012 after losing military and police support over the arrest of a prominent judge. He ran for the presidency again in 2013 — the Maldives’ second multiparty election — and lost to Gayoom’s half-brother, current President Yameen. Since then, Yameen has ruled with an iron fist, erasing many features of the young democracy. His government subjects journalists and social media users to punishing fines for defamation. Its control of the courts resulted in a much-criticized trial of Nasheed, who in 2015 was sentenced to 13 years in prison. The vice president, Ahmed Adeeb, was also arrested in 2015 after what the government called a failed assassination attempt on Yameen. Adeeb is currently serving a 33-year prison sentence on terrorism and corruption charges. A report by the Organized Crime and Reporting Project released earlier this week alleges that Adeep was among many officials including Yameen who illegally leased scores of the country’s more than 1,000 islands for tourism development, keeping tens of millions of dollars in graft in 2014-15. Yameen’s only contender in Sunday’s election is longtime lawmaker Ibrahim Mohamed Solih, backed by Nasheed who is now living in exile in neighboring Sri Lanka. Nasheed had hoped to run again, but was disqualified because of his outstanding prison sentence. Francis reported from Colombo, Sri Lanka. Associated Press writer Mohamed Sharuhaan contributed to this report.